You are what you eat is an adage that holds more truth than you may realize. Unfortunately, many people today focus their diet around processed foods that are high in sugar, sodium and fat. Diets such as this can increase a person’s risk of developing diabetes, heart disease, obesity, and more. You can protect your body and health against such illnesses, however, by eating lean meats, fresh vegetables, and by adding the following “superfoods” to your diet. This edible stalky plant of the cabbage family is loaded in potassium, vitamin B-6, vitamin C magnesium, and calcium. Scientists believes broccoli’s phytochemicals – organic chemical compounds which occur naturally – are able to aid in skin health, regulate blood sugar levels, strengthen the immune system, and ward off joint inflammation. Don’t let its small size fool you into thinking its a food with little-to-no nutritional value. 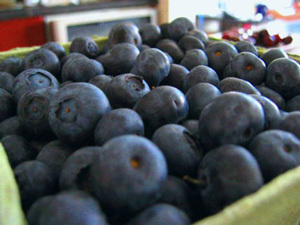 The blueberry’s deep purple-blue hue signifies the presence of powerful antioxidants known as flavanoids. Once consumed, these flavanoids work to neutralize cell-damaging free radicals that roam our bodies, attacking otherwise healthy cells. Oilive oil, particularly the extra-virgin variety, is another incredibly powerful superfood. Just a single tablespoon (13.5 grams) holds 10 grams of monosaturated fat and 1.4 grams of polysaturated fat. I know what you’re probably thinking: isn’t fat bad for your health? Trans fat and saturated fat are both considered bad, but monosaturated and polysaturated fat are beneficial, as they work to lower bad cholesterol (LDL) levels and raise good cholesterol levels (HDL). There’s a reason why it’s Popeye’s food of choice. Native to Central and Southwestern Asia, spinach (Amaranthaceae family) is must-have food for any health-conscious individual. It contains vitamin C, vitamin A, vitamin B-6, magnesium, potassium, beta-carotene, lutein and zeaxanthin. We can’t talk about superfood without mentioning salmon. This distinctively pink-colored fish is known to improve cognitive brain function while reducing the risk of cardiovascular disease. “Of all the different types of fish, salmon has received the most praise for being a nutritional marvel,” wrote Jo Lewin, nutritional therapist and author for BBC. Yogurt contains healthy bacteria known as probiotics which support the digestive system. With thousands of microscopic workers helping to flush out your digestive system, you’re less likely to develop constipation, diarrhea, and similar stomach problems. In order to reap the full benefits of it, however, you should stick with the low-fat Greek variety. Last but not least on our list is pistachios. These delicious nuts are packed full of protein, fiber, and healthy omega fats. And unlike many other nuts, pistachios are relatively low in calories. A serving of 30 nuts will only net you 100 calories. Blueberry photo by Jennie Faber under Creative Commons 2.0. This article was posted in Nutrition, Wellness and tagged diet, superfoods. Bookmark the permalink. Follow comments with the RSS feed for this post. Both comments and trackbacks are closed.